The Haws 1501 Drinking Fountains is a "Hi-Lo" wall mounted barrier-free unit. 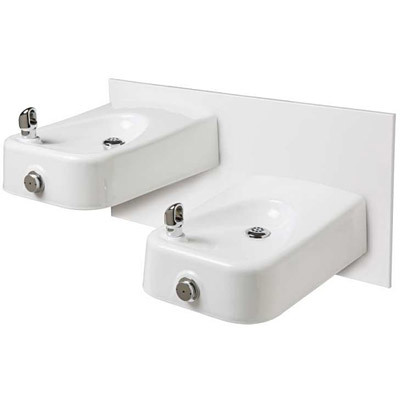 Shall include dual white enameled-iron basins, push-button operated valves with front-accessible cartridge and flow adjustment, polished chrome-plated brass vandal-resistant bubbler heads, polished chrome-plated brass vandal-resistant waste strainers, vandal-resistant bottom plates, white powder-coated stainless steel back panel with matching in-wall mounting plate, and 1-1/4" IPS traps. Perfect for either public or private settings, our gleaming white enameled iron series is one of the sturdiest wall mounted fountains Haws produces. This unit is the perfect fit for high traffic areas where there is a greater need for multiple drinking stations. Elegant gloss finish and color consistency throughout the enameled iron maintain the fountain's overall appeal so it always remains looking as new as it did when it was installed. Specifically, this type of wall mounted drinking fountain may be placed in settings such as: parks, schools, and other indoor/outdoor environments where the temperature remains above freezing. Haws Part# 1311 BOWL (QTY.2) - White enameled iron bowl; Haws Part# 1501 TRIM - Valves, bubbler and components; and Haws Part# 6715 - Steel in-wall mounting plate.